I Ride My Bike Because My City Believes in Bikes | One woman. Many bicycles. I googled my name today. For professional reasons, of course. On Monday, my company was acquired by a company with a different market strategy. So I’ll probably be looking for a new job soon, and I was wondering what a prospective employer might uncover in an internet search for my name. The good news is that (a) I am mayor of my own name, with 7 of the top 10 search results referring to me and (b) the results make me look like more of an industry expert than I truly am. Just for fun I also searched for my name + bike, which led to some old race results, a video from Monitor Pass that I took from the back of a Goldwing motorcycle, and blog posts about the Low-Key Hill Climb that I coordinated in October. 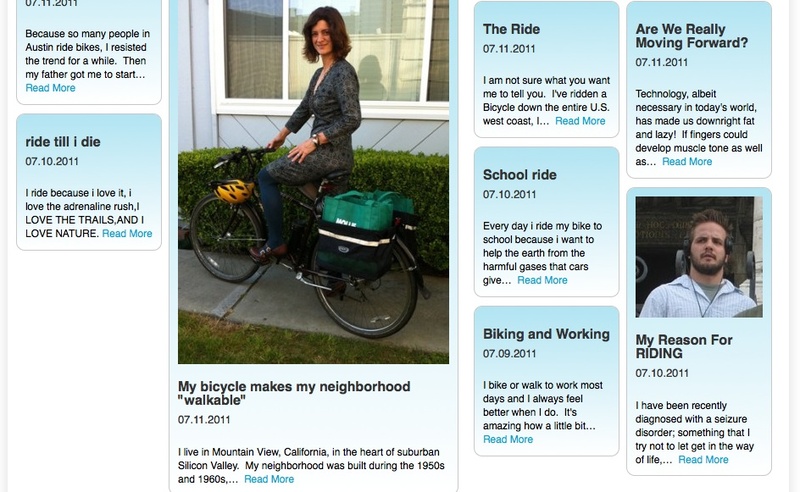 Then there was a “Share My Story” that I had submitted to the People for Bikes web site last July, something I had forgotten about. It even had a photo. I live in Mountain View, California, in the heart of suburban Silicon Valley. My neighborhood was built during the 1950s and 1960s, when cars were assumed to be the only means of transportation. I live five miles from my workplace, my doctor, my dentist, and a top-tier shopping mall. I live two miles from my pharmacy, the hardware store, the garden center, and a movie theater. I live one mile from the library, the post office, trendy restaurants, and a weekend farmers market. I live 1/2 mile from the grocery store. When I moved here 25 years ago, I drove my car to all these places. But because my city invested in bicycle infrastructure, I now ride my bicycle instead. Each year, my city has used a small fraction of their transportation dollars to build bike lanes, to adjust traffic signal sensors for bikes, to install bike racks, and calm traffic in my neighborhood. My city has also built a 5 mile “recreation” trail that doubles as a car-free route for children attending four elementary schools, and as an alternative to a bumper-to-bumper freeway commute for employees at companies like Google and Microsoft. Because my city and its neighbors believed in bicycles as transportation, I save money on gas, reduce wear-and-tear on my car, and get exercise everyday. If more people used bikes instead of cars for their daily errands, our air would be cleaner, our neighborhoods quieter, and our businesses could use their valuable real estate for creating or selling products or services instead of housing parked cars. Surveys show that people would ride bicycles more if our streets were made safer for bicycles. I know it made a difference for me. The transportation bill managed to get out of congress with bike funding intact. Whew! But I know that bicycle and pedestrian programs are often the first parts cut. The reason? Many lawmakers and their constituents have never lived somewhere where bicycling was an easy, safe, pleasant alternative to driving a car. So sad. What could your town or city could do to be more bike-friendly? Have you told your elected officials? Let me know what kind of gig you’re looking for: might be able to help out. Have a scan of the calendar at hackerdojo.com to see if any networking events interest you. I’m a member there. Thanks, Alison! I’ll let you know how I might need help as things unfold.